The American brand has teamed up with DreamWorks Animation to celebrate the UK launch of Turbo, the tale of an unassuming little snail who wants to go faster. In the movie, Turbo gets sucked into the supercharger of a Chevrolet Camaro ZL-1 drag racer, fusing his DNA with nitrous oxide. The next day, he wakes up vested with the power of incredible speed and accuracy, as well as some of the characteristics of an actual car, such as eyes that light up like headlights, and a shell that blinks red like taillights and makes car sounds and music from a radio. To celebrate the launch of the film, Chevrolet is participating in a series of pre-screenings of the new animation at cinemas across the country during the first two weekends of October, taking place in Cambridge, Livingston, Oxford, Poole, Portsmouth, Stockton and Wolverhampton. The events will be used by Chevrolet dealers as a customer relationship incentive. "Turbo is one of the most anticipated films of the year, and we couldn't be more excited about this collaboration," said Tim Mahoney, Chief Marketing Officer, Chevrolet. "Millions of future drivers will be inspired by Turbo to realise their dreams both big and small." 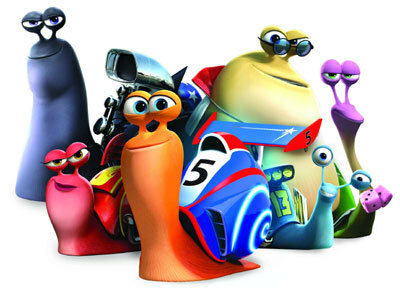 DreamWorks Animation's Chief Marketing Officer Anne Globe said: "In a film about a slow snail who dreams of being fast, who better than Chevrolet to give our hero his first taste of high-speed driving on the open road? Our relationship with Chevrolet is a natural fit that adds a layer of authenticity to this wild ride of a story." Turbo’s first appearance in Europe occurred in September, where he shared space with a Camaro and a Corvette on the Chevrolet stand at the Frankfurt Motor Show. The film itself opens to the public on October 18th in movie theatres across the UK, and will be supported by an on-screen Chevrolet cinema advertising campaign. For more information about the film, visit turbomovie.co.uk, or to find out more about the Chevrolet UK model range, including the all-new Trax small SUV and other family-friendly models such as the Orlando and Captiva, go to chevrolet.co.uk.